Today, I met and fell head over heels for our new puppy that we get to bring home this Friday. His name is Barnaby and he’s a Harlequin Great Dane. He’s a sack of potatoes at 5 weeks, weighing in at ten pounds. My friend, Linda, messaged me his picture last night. He was purchased last week and was abandoned at her veterinary practice when the new owners learned that he had developed Parvo. Linda and her husband gave Barnaby life saving treatments and now he’s all-better. 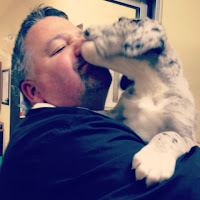 I’ve always wanted a Great Dane but I believe in adopting rescue dogs. And Barnaby is both! I have a feeling that my heart and my garden are never going to be the same after Friday. Let the countdown begin. Barnaby is our little nose biter.